Electric hoverboards are fun to ride, but they can also be dangerous if they were not properly built. Indeed, there have been quite a few cases of exploding or fire catching hoverboards because of cheaply made and not adequately shielded batteries. Nowadays, the UL 2722 certification of electric hoverboards ensures among other things that the batteries are properly built and properly shielded. It is definitely not recommended to buy electric hoverboards that were not able to get the UL 2722 certification. Both hoverboards that we will be comparing here are UL 2722 certified. 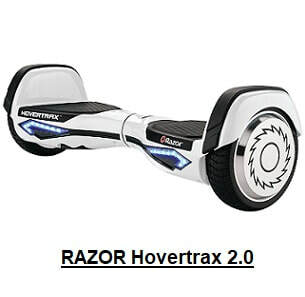 Note that the term "hoverboard" is a misnomer, because these fun devices don't really hover, but move on wheels. A more accurate term would be "self balancing scooters". 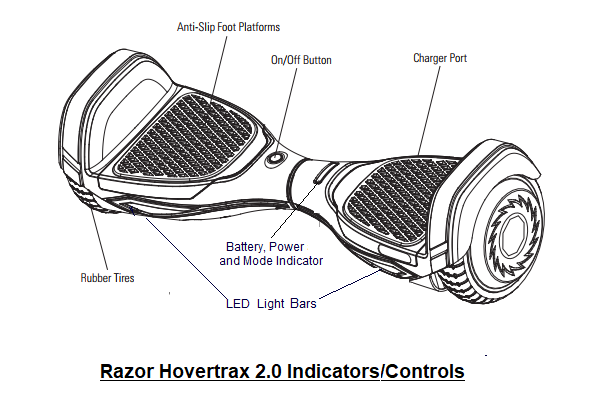 Nevertheless, we will keep using the term "hoverboard" in this article to keep up with the trend. Both electric hoverboards to be considered here represent a self-balancing personal transporter that uses gyroscopic technology that offers a brand-new way to move and have fun. They are electrically motorized, computerized, independently articulated, dual-platform, two-wheeled personal mobility systems. Being electric zero emissions products, they are also environmentally friendly. WARNING: If you plan to acquire either of the electric hoverboards to be compared here, be sure to read thoroughly the user manual that comes with the product and understand well all the warnings and operating procedures therein. Failure to read and understand the user manual increases risk of injury due to falls or other incidents. At the time of this writing, the SWAGTRON T580 and Razor Hovertrax 2.0 electric hoverboards were the most popular among Amazon customers. This article will provide a detailed comparison of these two hoverboards so you can easily make the right choice that corresponds to your needs. Note also that at the time this article was written, these hoverboards had received excellent reviews from most Amazon buyers with an average rating of 4.5 stars each out of 5 stars!. A charger is included with both products. Note also that both batteries are shielded securely to protect against overheating or fire hazards..
Razor Hovertrax 2.0 specs do not specify the maximum safe incline that the hoverboard should be used on. Razor recommends to ride the hovertrax on flat surfaces. But some users of this hoverboard have noted that it can be safely be used on up to 30 degree slopes. Pressing toes on both feet downward moves the hoverboard forward. Pressing heels on both feet downward moves the hoverboard backward. To turn left, slightly push your right foot down on the front of the right foot platform; to turn right, push down on the front of the left foot platform. To slow down or stop, apply pressure to the rear edges of the foot platforms by pushing down with your heels. When slowing or stopping, if you continue to apply force to the edges opposite the direction of travel, you may not only stop but continue on to reverse your direction. SWAGTRON T580 has a Learning mode and a Standard mode. Razor Hovertrax 2.0 has a Training Mode and a Normal mode. Learning & Training Modes: They are ideal for new or inexperienced riders. They control the maximum reachable speed of the hoverboard, so you can practice balancing and general movement. Standard & Normal Modes: They should be selected by more experienced riders. They remove the learning and training modes restrictions and allow the unit to reach higher speeds. For both hoverboards, you can switch the riding modes directly on your board by pressing the power button twice in a row (please refer to your user manuals for exact procedures). Note that on the SWAGTRON 580 hoverboard, you can also changed modes via the SWAGTRON App which is available in both the App Store and Google Play Store. Both hoverboards have sensors under the pedals. When the rider steps on a pedal, these hoverboards will adjust themselves to balance automatically. Note that when riding, you must make sure both feet are touching the pedals so the balance sensors can properly be triggered. Both the SWAGTRON and Razor hoverboards are equipped with LED indicators to indicate system parameters such as the battery charge level. The chassis (casing) material for both hoverboards considered here is durable hard plastic. Note that they are rocklike solid for being plastic. If their casing were metal, it would have been difficult to carry as the internal axle and battery make them heavy as it is. Both hoverboards are equipped with LED light bars. ​The LED light bars (kind of headlights) let others see you when you are moving. SWAGTRON 580 has blue LED light bars across the front and red LED light bars across the back. Both hoverboards are equipped with hard rubber tires and aluminum-rimmed wheels. SWAGTRON T580 is equipped with speakers and support Bluetooth connectivity. So the hoverboard's speakers can use Bluetooth to play music directly from your phone while you ride. With SWAGTRON T580, you can download to your smartphone the free SWAGTRON App which is available in both the App Store and Google Play Store. You can use the App to select the riding modes, check your speed, monitor battery status, play music, etc. Now that you have all the characteristics of all these two electric hoverboards, you should be able to select, in the Amazon products section below, the one that best matches your requirements or the needs of your child or teenager. So, which electric hoverboard is best for you? If you want to control your hoverboard using your smartphone, or if you want to listen to music coming out of your hoverboard's speakers, you should consider either SWAGTRON T580. 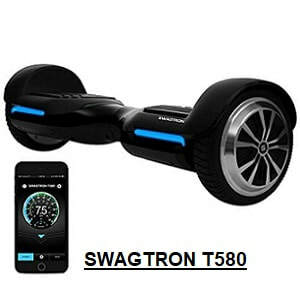 If you want your hoverboard to be equipped with movement indicating lights, you should consider SWAGTRON T580 which has blue LED light bars across the front and a red LED light bars across the back. ​The blue LED lights on the Razor Hovertrax are only on the front of the hoverboard and they don't change colors. On the other hand, if you are looking for a more powerful hoverboard, you might want to consider the Razor Hovertrax 2.0 which is equipped with 350W dual hub motors as opposed to the 150W dual hub motors on the SWAGTRON T580. Keep your feet on the pedals. Taking your feet off the hoverboard while riding is incredibly dangerous. Your hoverboard can only support the weight of one person at a time. Remember, only ride your hoverboard where it is permitted. You must comply with local laws and give way to pedestrians. ​Read carefully the hoverboard's user manual and all the safety recommendations described therein before riding your hoverboard for the first time . 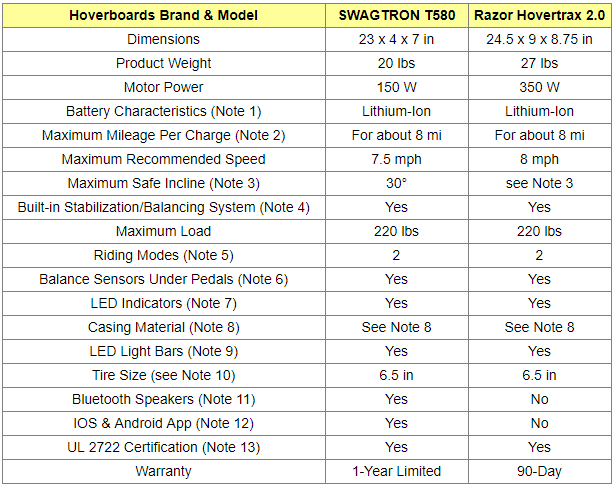 SWAGTRON T580 abd Razor Hovertrax 2.0 hoverboards are both available below on Amazon. Note that if Razor Hovertrax 2.0 is not available, you might want to consider Razor Hovertrax 1.5 instead, which is also offered below and which has very similar featyres to Razor Hovertrax 2.0. ​For a comparison of Razor electric scooters, please click: Comparing Razor Electric Scooters.